-William Coco "At last---a book documenting the beginnings of Off-Off Broadway theater. 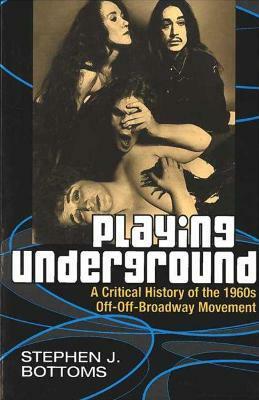 Playing Underground is an insightful, illuminating, and honest appraisal of this important period in American theater." "Bottoms clears a path through what was always a wildly overgrown grove.... The discoveries he makes along the way force us to rethink our understanding.... Bottoms's book, written with enormous intelligence, dexterity, and passion, should be read by the current generation of radical theater makers....." - Village Voice "Playing Underground... goes to almost archaeological ends to unearth OOB's underpinnings... we get a whiff of the addictive immediacy of The Scene, the sense of something (good or bad) constantly happening.... Freedom, both dangerous and exhilarating, defines Bottoms's prose." - American Theatre "Playing Underground does the great service of bringing these productions to life again, in all their hit-or-miss glory." - Theater"
Stephen J. Bottoms is Professor and Chair of Theater Studies and Director of the Workshop Theatre at the University of Leeds. He is also author of Albee: Who's Afraid of Virginia Woolf? and The Theatre of Sam Shepard: States of Crisis.